The real concern is not inside the detention basin. It’s the outfall pipe that has failed, and the heavy woody vegetation on the dam face. Fortunately, this is not a wet pond but it’s probably meant to hold more water than it does now. The ‘normal’ water elevation reads pretty clearly in the photos. 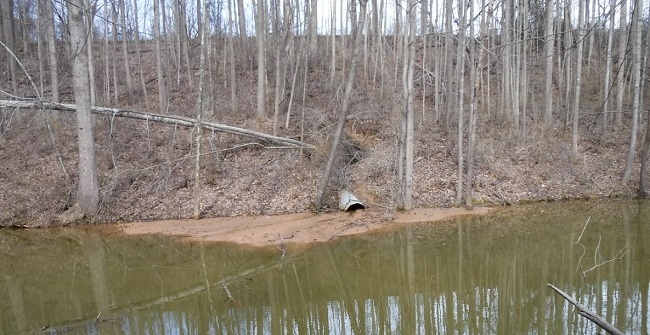 Outfall pipe with fallen trees. Note plume of sediment. View of fallen trees from top of dam. Note plume of sediment below. Crevasse over the outfall pipe. Outfall pipe exposed by erosion. View of pond with dam beyond. Note heavy vegetation on dam face. Note the clear water line below the orifice. In regards to the correct filing of info, the screen shot shows inital report to Maintenance and Stormwater Management Division. Confirmation from MSMD was received, but no actual response. Please review and reconsider this issue. Thank you. 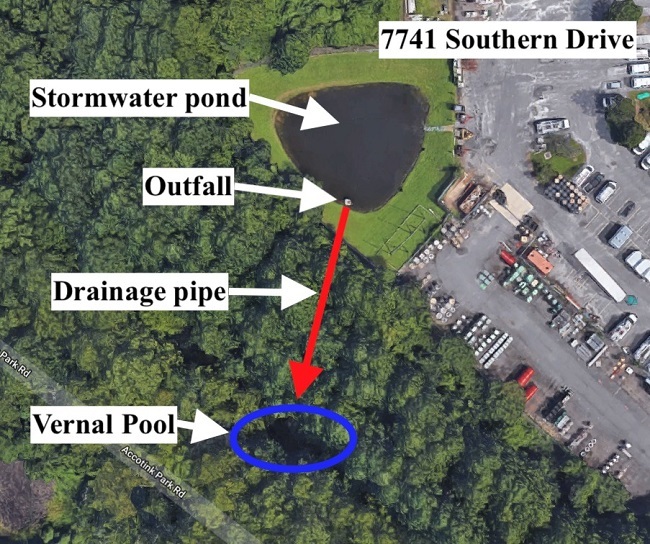 In response to the Friends of Accotink Creek complaint, today I walked around the private dry pond DP0353 behind Cox Communications at 7741 Southern Drive Springfield, VA 22150. I saw no obvious pollutants from Cox Communications facility entering the dry pond. The dry pond has no vegetation and has a large amount of sediment build-up in it. The sediment appears to be discharging into the vernal pool (on GIS map farm pond FM0495) on Lake Accotink Access Rd. I think this is an Maintenance and Stormwater Management Division private dry pond inspection issue. This afternoon, during a watershed walk, we observed a vernal pool that was severely contaminated with sediment. Instead of its usual dark, black color, the pool was orange-green, indicating large levels of suspended sediment, and possibly algae associated with a nutrient influx, and there was a layer of sediment residue on the leaves along the edge of the pool. We had just observed several flourishing vernal pools further downstream, with large numbers of active wood frogs and egg masses in clear water. This pollution event has likely wiped out any possibility of supporting vernal pool obligates in this pool this year. There was an obvious delta of fresh sediment at the base of a metal outfall pipe coming down the slope and draining into the pool. Closer observation showed that there had been a blowout, likely due to a failure of the pipe, scouring out large amounts of sediment around the pipe, and causing several trees to collapse. This was clearly the source of the sediment pollution. The blowout had created a large cave-like hole in the slope, with water still dripping out of the pipe. We went to the top of the slope and found a large stormwater pond, apparently connected to the property at 7741 Southern Drive, which looks like a Cox Communications facility. There is a large parking lot and several buildings draining to that stormwater pond. The pond looked like it was a "wet" pond, but it had no water in it despite the recent rains. We surmised that the outlet pipe had failed, and so instead of retaining water during rain events, water was flowing through, damaging the outfall pipe, and causing the sediment pollution of the vernal pool. -Who is responsible for this apparent failure. -How the failure can be addressed (Thunderstorms are forecast for Friday March 15). -How the damage to the vernal pool will be mitigated. 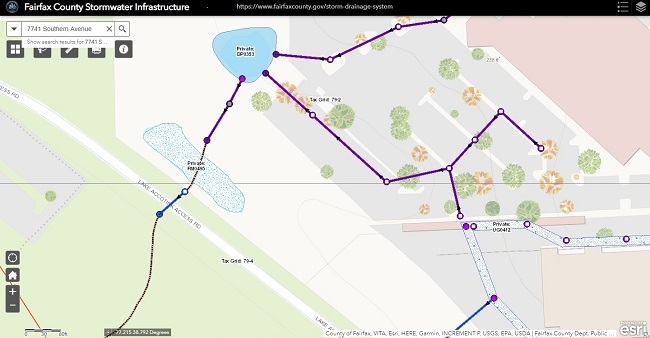 Fairfax County website lists the stormwater pond as DP0353. "DP" means dry pond, but it has held permanent water for years.